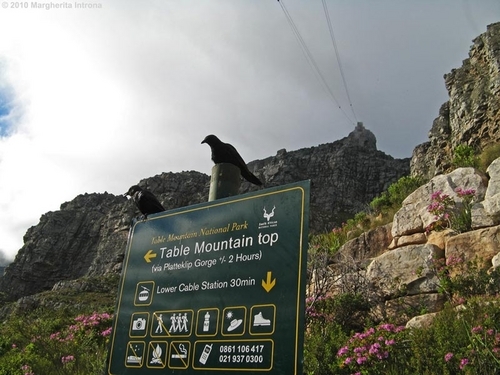 While in CT over the Easter breaks our group want to hike up table mountain. Not much experience hiking and don't want to do anything hard. (I've read the India Venter news on here the last couple of years). Which trail do you guys suggest. If you want to walk up the front of TM then Platteklip Gorge is the safest route to take. It's a wide trail, very hard to go off route (even in poor visibility) and there should be plenty of people walking the route over the weekend. Indian Venster (the route under the Cable Car cables) is a little more advanced. There is a scramble section were numerous accidents have happened over the years. The scramble is now equipped with a staple ladder. Kloof Corner would be out of the question for you. 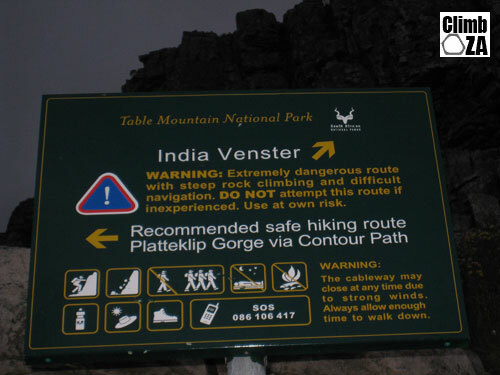 Sign at the start of Indian Venster route. One of the nicest and most enjoyable ways up Table Mountain is take either Skeleton Gorge or Nursery Ravine from Kirstenbosch Botanical Gardens. Not as fast or as easy as Platteklip (and they bring you out nearer to MacClear's beacon rather than the the cable station) but far, far nicer. Agreed, the back table is beautiful. A nice route is starting at Kirstenbosch and then taking Platteklip down. Skeleton Gorge has two ladders and some easy boulder hopping in places, but is not technically difficult (it's also shaded by a canopy of trees). Thanks for the tips, gonna check them out. The sign (at the start of Indian Venster) has been replaced with one that does not make mention of the Indian Venster route! Thanks to Margherita for sending the photo in. Down Platteklip or India Venster. Remember that the Cable Car and shop is about 500m further than the turnoffs you'll be using for these routes. It is touristy but worth a visit. A nice hike and real easy is up Kasteelspoort, lurk around the top to your hearts content, then go down Skeleton Gorge. You''ll need transport to fetch n carry because they are on opposite sides of the mountain. Just a note that, Kastelspoort and the hikes from Kirstenbosch arrive at the top of the mountain a long way from cable station. They are all easy technically but you need some reasonable fitness to enjoy them. Remember to take water, sunhat, sunscreen and proper warm clothes. Ensure you have a cell phone with metros number 10177 in case of emergencies. My favorite hike up is diagonal route on the Camps bay side pick-nic at the top and kastelspoort down. Though I don't know if anyone will agree with me because some sections are a bit of a slog. If you want to go up the front to the Cable Station the only option is Platteklip Ravine, it is not the greatest hike, however. But if you are going to do it start early as it gets very busy and can get very hot in the ravine. Take enough water as it can take about 2 hours up and you don't hike along the stream seen at the bottom. Some of our company arent really that fit yet and it seems that Platteklip Gorge is the easiest safest. We will probably end up doing this one day and another day do a bit more of a technical route. If you are looking for an easy hike and don't want to go to the top the hike up to cecelia falls is quite nice, not technical and quite short. This is on the Kirstenbosch side. The easiest way to the top is via corredor ravine, easiest slope but longest walk. This does get you to the tranquillity cracks which is pretty amazing. This is above camps bay. For the technical day you can try left face "B" route or the africa ledge route. But these have proper exposure. Not for the unfit or inexperianced.